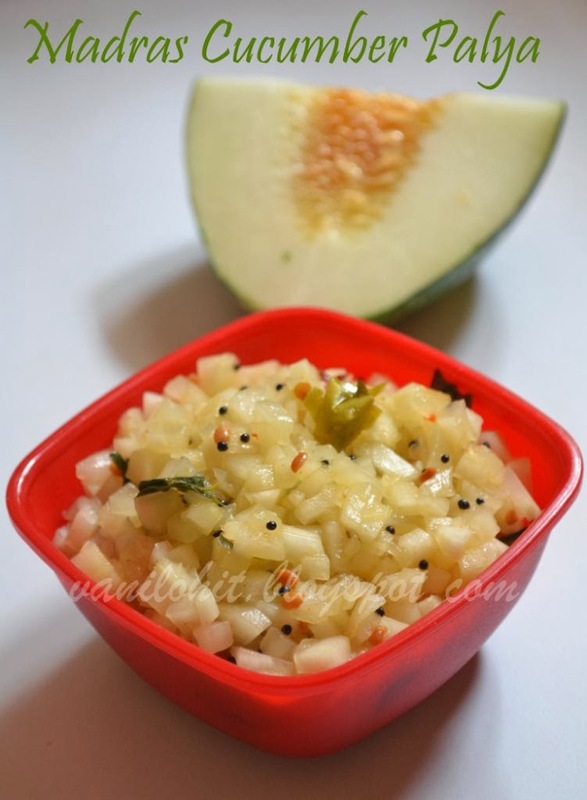 I am back with a traditional Havyaka recipe today! Its a side dish which is not known to many people during this era of modern style cooking. But even now, many of such traditional and rare recipes are still in use at my Grany's place. Authentic name of this dish is 'Kochchuli' and some people call it as 'Palya'. My mom had visited us for few days recently, and she prepared this tasty side dish for our lunch one day. I just tasted a byte and clicked few photos immediately and noted down the recipe from mom. 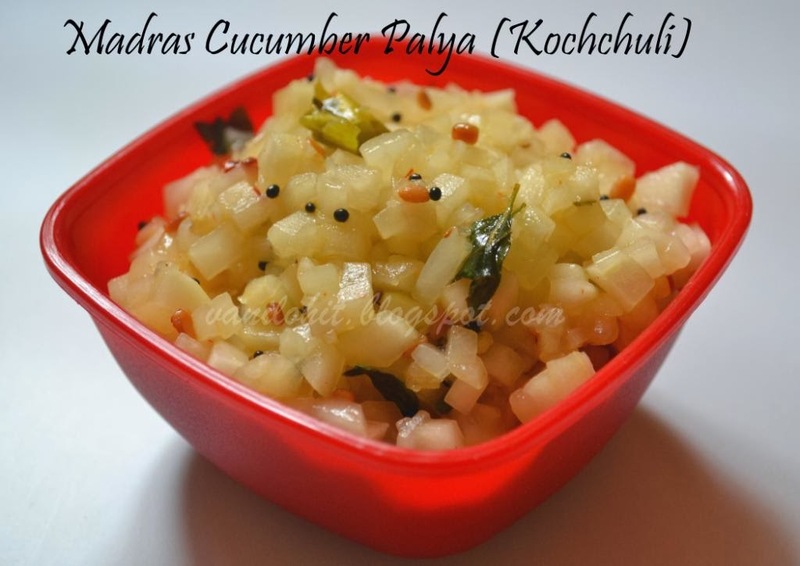 Not only madras cucumber, normal cucumber also goes well for this recipe. But the veggie must have been well grown, not the tender ones. In rural areas,people use a veggie similar to Madras cucumber, called Mogekayi (Magekayi) and home grown cucumber for this recipe. Peel the cucumber and remove the seeds portion. Chop the veggie finely. Heat oil in a frying pan. Add red chilli pieces, urad dal, mustard seeds and asafoetida. 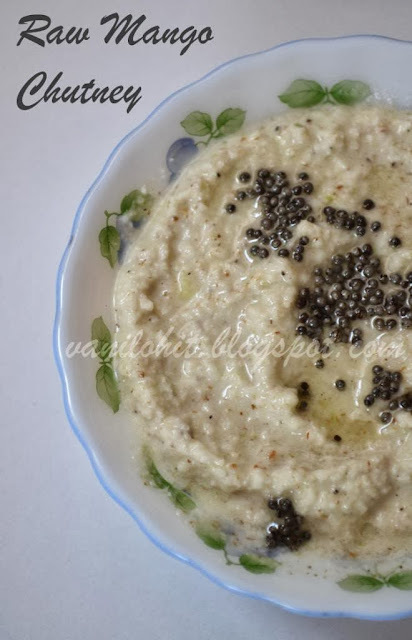 Once its roasted nicely and mustard seeds start spluttering, add chopped green chillies and curry leaves. Then add chopped cucumber, lime squeeze and salt to taste. Cook it on medium flame for 3 - 4 minutes without closing the lid. No need to cook it till very soft. 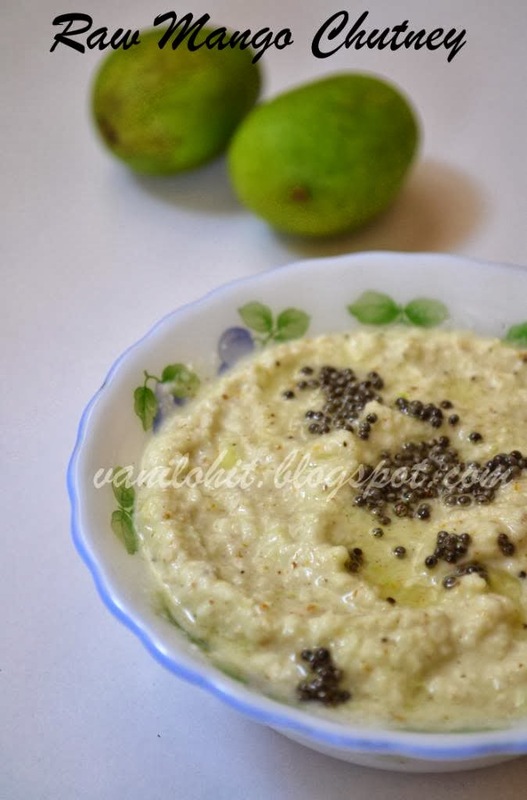 Simple and delicious Palya is ready to serve! Enjoy it with rice. As we all know, finger millet is very good for health. Regular usage of finger millet helps to keep our body cool. But it won't has a nice taste or aroma of its own. 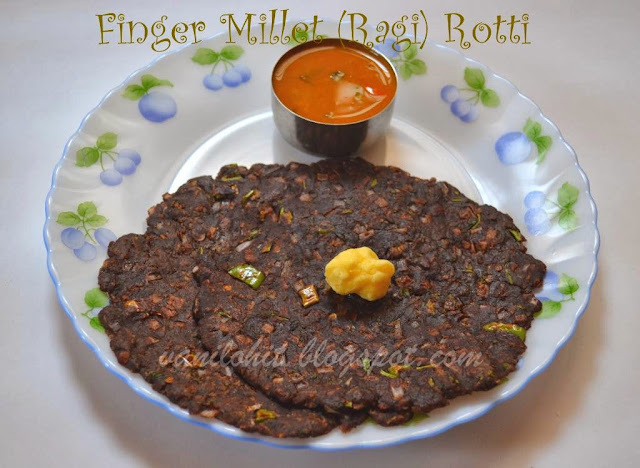 That's why many people won't like to eat or drink anything prepared using finger millet! Long back, I had tasted Finger Millet Rotti in a hotel at Malleshwaram. 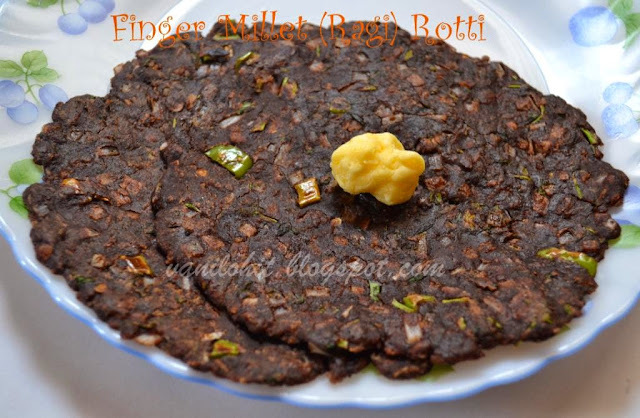 Never I thought that finger millet rotti can be so tasty! Then, I tried my own version of rotti at home and it came out well. Not regularly, but sometimes I prepare this rotti for our breakfast. I love to add fenugreek leaves to this rotti, also you can substitute fenugreek with dill leaves. Clean the fenugreek leaves and chop them finely. Transfer the finger millet flour to a mixing bowl. To this, add all the ingredients except salt and hot water and mix well. Now, add hot water little by little and mix it nicely. Consistency should be the same as chapathi dough i.e., you should be able to make balls from the dough. Let the dough rest for 10 - 15 minutes before making the rotti. Make lemon size balls from the dough. Pat them thinly on a greased plastic sheet or plantain leaf. Make a hole in the middle of the rotti. Cook the rotti on hot tava on both the sides. Add 1 - 2 spoons of oil while cooking. Serve this rotti along with butter or any other side dish. You can substitute fenugreek leaves with dill leaves also. This is the season for mangoes in India. Up-to last week we were enjoying only raw mangoes. We both love to eat them in raw form as well as for cooking. Now a days, varieties of ripe mangoes are available everywhere. Frankly speaking, we are making the fullest use of the mango season this year! Heat 1/2 tsp of oil in a small wok. Roast cloves and coriander seeds nicely, then add chopped green chillies. Saute it for 2 minutes and switch off the flame. Grind the roasted ingredients along with chopped mango and grated coconut. Add little water while grinding; don't make the chutney too watery. Transfer the chutney to a bowl. Add salt to taste and mix well. If you want, temper it with mustard seeds. That's all, delicious chutney is ready to serve! This can be mixed with rice or can be used as pickle or thokku.